I quite often get emails from eBayers, wholesalers and bargain hunters who want to buy clothes and other items in bulk to sell back home, either by export or simply carrying goods home in their luggage. From experience, I also know that savvy shoppers looking for a deal on a year’s supply of fisherman pants, or multi-buys like 3 vests for 100 Baht , love trawling the markets too. 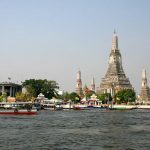 Those of you who've visited the city know that there's pretty much a market on every corner, so I've combed the city and come up with a list of 12 markets in Bangkok that you should definitely consider on your shopping itinerary. In addition to clothes and crafts, I've thrown in some food and flower market options which are worthy outings too. You'll want to bookmark this page in advance of your trip, as there's a lot of information here. Man, if I had a dime for every time I've been here. 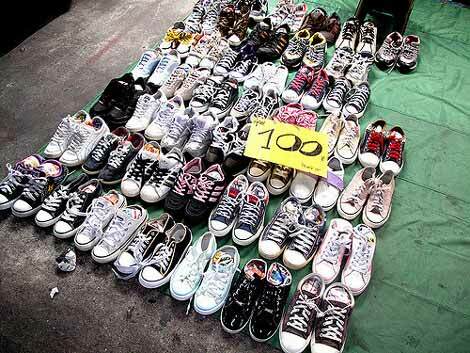 Filled to the brim with bargain clothes, shoes and other accessories, Pratunam market is one of the most visited in Bangkok for its fantastic deals and fun atmosphere. Warning though: The outdoor area can get very packed which makes it difficult to walk around. It also gets hot. Textile fiend? Clothes lover? Boebae is another great option for deeply discounted garment shopping, mostly geared toward those buying in bulk. 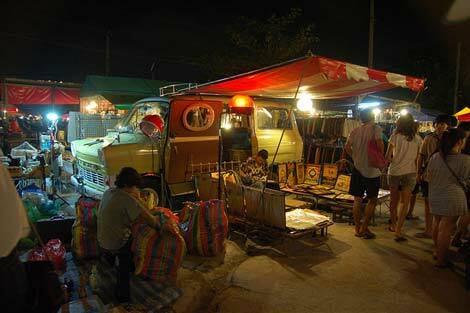 Another of my favourites, but relegated to the weekends, Chatuchak is the biggest market in Bangkok. It has everything and spans 35 acres, but don't let this intimidate you. It's a fun day out with plenty to eat, busking entertainment and lots of weird and wonderful things to buy. Not the prettiest on this list, but give it a chance because Sampeng is the holy grail for cash strapped travelers looking to make a buck (or few) selling foreign goods overseas. 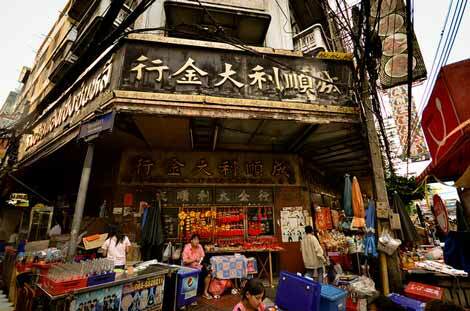 The China Town area is a giant complex of bustling markets and you can find pretty much anything under the sun in these stalls. In the late afternoon you'll find sellers lining the streets with small offerings of vintage goods like watches and amulets, but be careful not to get sucked in if you don't know what you're buying. It's an interesting sight to see, though. You'll also come across the famous Klong Thom market, which is a haven for second-hand goods like games consoles and other electronics, old bits and bobs, DVDs and more. I have an extensive review of this market – which you can read here – because it really does deserve it. Alas, perhaps my favourite night-time wander. 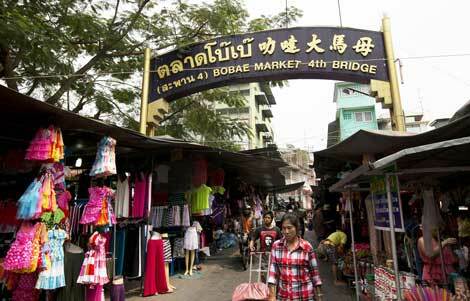 Rot Fai is a happening place where young Thais go to browse, eat, sell and hang out. Expect to see lots of old VW camper vans turned into make-shift shops selling everything from old vinyl to cool-slogan tees. 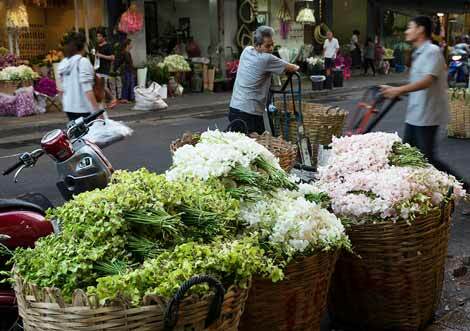 Inarguably Bangkok's most beautiful market, Pak Klong Talad has a long history of providing the city with its share of gorgeous and incredibly fresh flowers. Looking for an assortment that includes the rare and beautiful orchid? 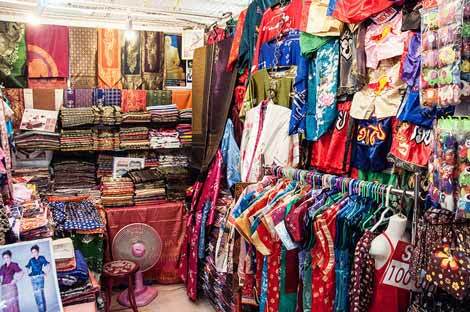 Look no further than Pak Klong Talad, which offers large bundles of either 50 or 100. 3. 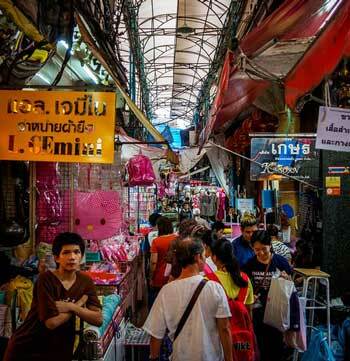 What prices to expect: You'll feel far from the overpriced and overrun markets of Bangkok that often trap tourists. 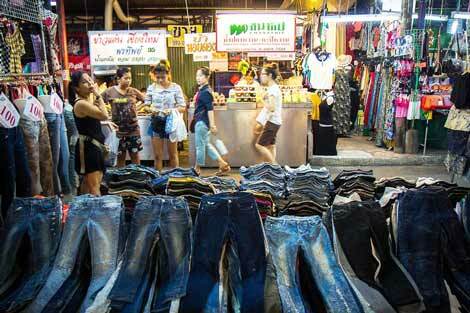 Prices, however, are not fixed so feel free to bargain on goods for a few less baht than they're marked. Wang Lang will have you saying ” aroi mak mak!” (“delicious!”) before you know it. Little known to tourists, but loved by Thai university students, the Wang Lang market houses a variety of delicious street food vendors. It also offers up some bargains on trainers, tees and other loose clothing in and around the lanes. 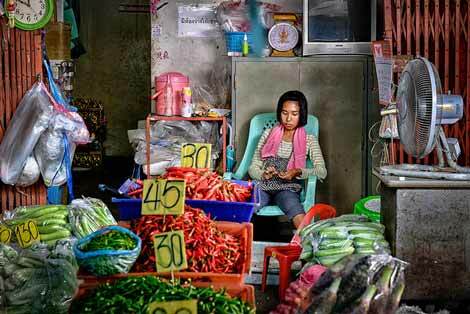 5 Top Haggling Tips: Bag the Best Bargain! 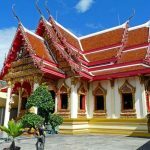 Be friendly: Thailand is known as the Land of Smiles for a reason: Thai people respond well to friendly behavior and haggling is no exception. To ensure that you get off on the right foot, approach with a friendly countenance and give the vendor a smile- lighten the mood. Buy in bulk: This is generally going to yield you the best price. That being said, don't try to haggle if you're purchasing in large quantities, as chances are, it's already wholesale. There's nothing more ungrateful than a tourist trying to haggle a sale price. Stay composed! If you've never haggled before, it might be nerve wracking, but just remember not to raise your voice or gesture violently. Thai vendors will respond much more favorably when you approach the situation as a game of jest- not as a serious competition. They'll likely appreciate your patronage more if you're not forceful in getting the best price. If you feel you're being ripped off, don't force the issue. Just leave it. Chances are, if you say ‘thank you' and walk off, you'll find that the vendor will fold to your price or that you'll find something incredibly similar 5 steps down the road from a vendor who will sell it closer to your preferred price. Don't make a scene or try to argue! Watch your bag: It's much easier if you decide to bring a backpack to the markets, so you're not bogged down by multiple plastic shopping bags. However, if you do decide to wear a backpack, position it on your chest- that way you alone have access to its contents. Take money out carefully: Be mindful of how ostentatious you are with your wallet. Try to avoid dipping in every few minutes because you're letting a lot of people know exactly where you keep your stash. Buddy system: it's easier to stay safe if you have an extra pair of eyes. This might also detract pickpockets. If you can, go with a friend or acquaintance. Careful after dark: There are few places you shouldn't go after dark, and Chinatown might be one of them as unlit alley ways could attract pickpockets. 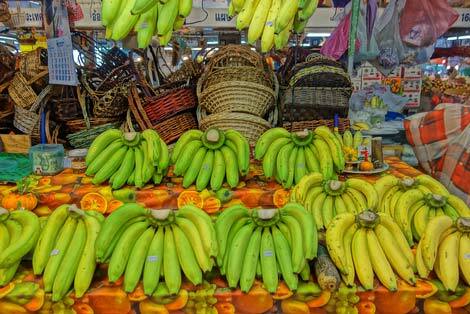 Be sure to ask your hotel or a local before deciding to peruse these markets late at night. Hello, Hoping you fine and in good health. I would appreciate to know where I can buy Stationery in bulk, black and white plain cotton t-shirts( V-neck), ( Round neck) , in( bulk ). plain cotton crop top ( bulk),plain cotton cami top (bulk) different colour, Plain cotton Tank Top different colour , card stock paper, transfer paper, different size of photo frame. Hoping to get some information soon before visiting Thailand. 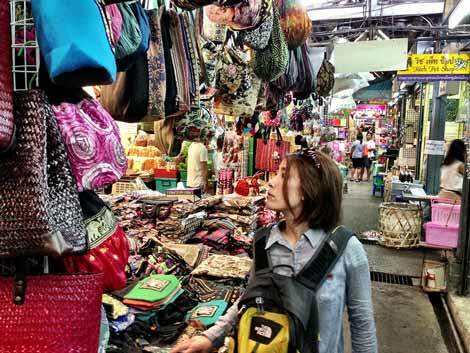 Hi, we buy elephant pants at BoBae to carry, but now we are interested in shipping to the US. Any idea of a contact who can help that speaks English? Thanks! jewellery, go to Chatujak (JJ mall market). Makeup is there too, but Pratunam market has a more. MBK also has a lot of Gold and Silver jewellery. Thanks for this post. It is very informative. Can you suggest best place for shopping for kids toys and accessories, ladies cosmetics etc. It depends what sort of quality you are after. 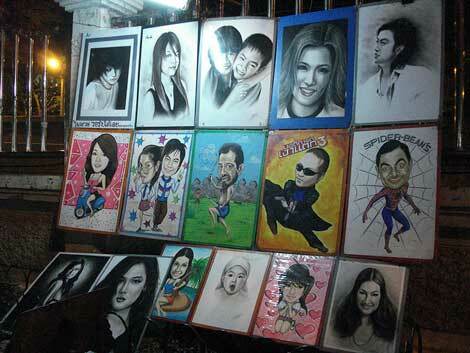 There's cosmetics at Pratunam but I'd be careful of fakes and low quality brands. Toys you will find some at Pratnam, Chatujak, and Sampeng. Please don't ride the elephants if you care at all about animals. These animals are badly treated!!!!! Hello! Thank you for the information, it helps a lot. Btw may I ask you, do you know where I can find cheap sea courier near platunam that ship to philippines? I plan to buy bulk clothes but I don’t know how and where to find cheap shipping company. Hello, I can no longer see your list of company for possible contacts to do business for importing goods from Thailand. No worries, thanks for reading. It's awesome. You'll love it! Good to go in the week as weekends can get packed.